These are a couple of Devi Mantras for making your skin beautiful and free from diseases and skin related disorders. The Devi Kavacham lists Vagishwari or Vageshwari Devi, another name for the Goddess of Divine Knowledge Saraswati Mata as the protector of the skin and Parvati Mata, the Mother Goddess as the protector of the head, bones, and flesh and blood. These Mantras originate from the Devi Kavacham, which literally translated into English mean the armor of the Goddess. It is also one of the more important to the Hindu protective prayers for the protection of the self, hence these Mantra are believed to be most potent and effective. There is no Siddhi procedure or any type of Puja-Aradhana-Tantra for practicing these Mantra Chants and they can be put to actual practice at anytime. The practice of this Mantra experiment is said to remove all kinds of skin diseases, infections and disorders and make the complexion smooth, blemish free and glowing. The Mantras are also said to protect and purify the skin from any of the above-mentioned disorders. To practice the Mantras to beautify the skin, a small water mug should be taken and all the five fingers of the right hand should be dipped into the water. Then both the Mantra should be chanted 21 times each, in order to infuse the water in the mug with the frequencies of the Mantras. Finally, the Mantra infused water should be consumed. Is it a one time pryog ? Yes, it is a one time Mantra Prayog. If you want, you can repeat it on Fridays. Sir the prayog can be started any day.but it should only be repeated on fridays, M i right? and sir in how many days the effect can be seen??? Sir should mantra infusion in water mug to b done separately for every individual. The Mantra Prayoga for every person can be done on the smae day, but seperately. If you wish, you can do the Mantra Experiment every day until you get the desired results. 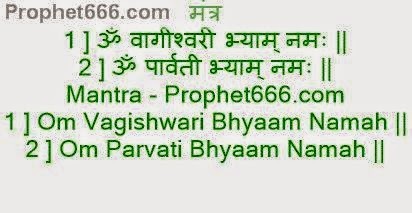 I have a baby girl she fell down from sofa got hurted to her head,still she is infant so can I chant this mantra 21 times and move my hand lightly over her body ? Sir can we chant this 108 times? If the skin is damaged you could try this Mantra otherwise there are many healing mantras and spells given on this site, which you can try to heal your daughter. There should be absolutely no problems for Non- Vegetarian people in performing this Mantra Experiment, you should only do what is mentioned in the article. Sir, this is my request to you,can u please post parvathi maa kavach?sir i need parvathi maa kavach pls post it sir ? Sir both the mantras should be chanted the first one 21 times and then the 2nd one 21 times or 21 times as the way they are written ? Sir my gf broke up vd me.but I want her.I want to marry her.now she is not talking to me but every time I think of her.what shud I do sir.tell me any easy one to get her back to me. Can I chant this Manthra with maximum devotion and transfer the Energy/ Benefits/ affects to my close relative living far away. I mean praying humbly to my God & Devatha of this Mantra to transfer the Energy/ Benefits/ Affects of the chant to the relative living far away? Kindly advise me Dear Soul. Yes, you can certainly perform remote transfer of the energy of this Mantra as from your language it can be seen that you truly love this person.